What is Apache Zeppelin ? Apache Spark is a fast and general-purpose cluster computing system. It provides high-level APIs in Java, Scala, Python and R, and an optimized engine that supports general execution graphs Apache Spark is supported in Zeppelin with Spark Interpreter group, which consists of five interpreters. The Spark interpreter can be configured with properties provided by Zeppelin. You can also set other Spark properties which are not listed in the table. For a list of additional properties, refer to Spark Available Properties. master local[*] Spark master uri. spark.app.name Zeppelin The name of spark application. spark.cores.max Total number of cores to use. Empty value uses all available core. spark.executor.memory 512m Executor memory per worker instance. zeppelin.spark.concurrentSQL false Execute multiple SQL concurrently if set true. zeppelin.spark.maxResult 1000 Max number of SparkSQL result to display. zeppelin.spark.useHiveContext true Use HiveContext instead of SQLContext if it is true. zeppelin.spark.importImplicit true Import implicits, UDF collection, and sql if set true. Without any configuration, Spark interpreter works out of box in local mode. But if you want to connect to your Spark cluster, you'll need to follow below two simple steps. In conf/zeppelin-env.sh, export SPARK_HOME environment variable with your Spark installation path. After start Zeppelin, go to Interpreter menu and edit master property in your Spark interpreter setting. The value may vary depending on your Spark cluster deployment type. Note that without exporting SPARK_HOME, it's running in local mode with included version of Spark. The included version may vary depending on the build profile. SparkContext, SQLContext, ZeppelinContext are automatically created and exposed as variable names 'sc', 'sqlContext' and 'z', respectively, both in scala and python environments. Note that scala / python environment shares the same SparkContext, SQLContext, ZeppelinContext instance. 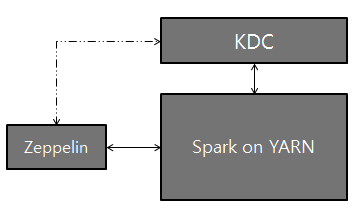 There are two ways to load external library in spark interpreter. First is using Interpreter setting menu and second is loading Spark properties. Please see Dependency Management for the details. spark.jars --jars %spark Comma-separated list of local jars to include on the driver and executor classpaths. spark.jars.packages --packages %spark Comma-separated list of maven coordinates of jars to include on the driver and executor classpaths. Will search the local maven repo, then maven central and any additional remote repositories given by --repositories. The format for the coordinates should be groupId:artifactId:version. spark.files --files %pyspark Comma-separated list of files to be placed in the working directory of each executor. Note that adding jar to pyspark is only availabe via %dep interpreter at the moment. export SPARKSUBMITOPTIONS="--packages com.databricks:spark-csv_2.10:1.2.0 --jars /path/mylib1.jar,/path/mylib2.jar --files /path/mylib1.py,/path/mylib2.zip,/path/mylib3.egg"
Note: %dep interpreter is deprecated since v0.6.0. %dep interpreter load libraries to %spark and %pyspark but not to %spark.sql interpreter so we recommend you to use first option instead. When your code requires external library, instead of doing download/copy/restart Zeppelin, you can easily do following jobs using %dep interpreter. Dep interpreter leverages scala environment. So you can write any Scala code here. Note that %dep interpreter should be used before %spark, %pyspark, %sql. Zeppelin automatically injects ZeppelinContext as variable 'z' in your scala/python environment. ZeppelinContext provides some additional functions and utility. ZeppelinContext extends map and it's shared between scala, python environment. So you can put some object from scala and read it from python, vise versa. ZeppelinContext provides functions for creating forms. In scala and python environments, you can create forms programmatically. In sql environment, you can create form in simple template. To learn more about dynamic form, checkout Dynamic Form. Interpreter setting can choose one of 'shared', 'scoped', 'isolated' option. Spark interpreter creates separate scala compiler per each notebook but share a single SparkContext in 'scoped' mode (experimental). It creates separate SparkContext per each notebook in 'isolated' mode. On the server that Zeppelin is installed, install Kerberos client modules and configuration, krb5.conf. This is to make the server communicate with KDC. NOTE: If you do not have access to the above spark-defaults.conf file, optionally, you may add the lines to the Spark Interpreter through the Interpreter tab in the Zeppelin UI. That's it. Play with Zeppelin!